To quote my buddy Freddy, storehouse of all things comics “Louise Simonson single-handedly brings me to tears each and every time I revisit the Death and Return of Superman.” I’ve still a ways off from the Supes run, but boy does Simonson’s X-Factor have a tendency to hit me in the feels. It could be the subject matter. It could be that I’ve got a one-year-old clinging to my pant legs for 12 hours every Tuesday. With the dexterity of the button-pressing in the cockles of my heart, I think it’s because she’s just that good. 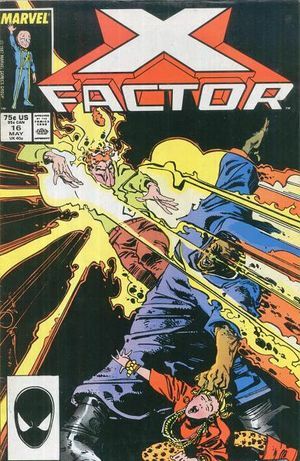 We open with Skids and Flame Demon throwing down in X-Factor’s version of the Danger Room, only for Skids to be tormented by demons of her past to when her mutant powers first appeared. This was at the hands of her father, and it’s stunning in the way Simonson deftly projects these scenes right into the story flow. Skids runs off after realizing what’s happening, but Flame Demon chases after her. She has another flashback in response to argument with Flame Demon. He and Skids have been a couple for awhile now, and after some talking, he feels the need to try and get a little intimate, sewers be damned. His powers go off this time (and more memory hassle for Skids) with some regret to the lady he scorched near the beginning of this series. The two are confronted by the Morlock known as Masque, a grotesque, hulking figure whose ability it is to make people’s faces like putty in his hands. His powers can’t work on Skids because they just skid right off. More on this later. Flame Demon has an idea, and takes it upon himself and a few others to go “rescue” from the hospital the woman whom he burned. Being a bit of a hateful guy, Masque can not only make people ugly but he can also make them beautiful. What a strange turn of events for this story, channeling Christianity, personal appearance, and acceptance of one’s actions. Nice change seeing a bit of action off the beaten path, even if I was missing an issue. There was some interaction between Cyclops and Jean Grey, but after this issue, they don’t count for much good reading anymore.